Costs for a college education have been trending up for years, with many universities costing $100,000 for a 4-year education. This has put lots of pressure on students financially and forced them to cut costs wherever possible. Many students of late have been forgoing car ownership altogether, as it is viewed as too expensive and cumbersome. Many kids take Uber and Lift rides and don’t even own a vehicle. There are others that do need to drive and thus need auto insurance coverage. Get covered for less with a free Rodney D Young auto insurance quote in just four short minutes. The cost of auto insurance for students has gone way up in recent years, with many policies costing $200 or more per month for these youngsters. Motorists under the age of 25 pay the highest premium cost of any group of drivers, even though, many works part-time and make minimum wage. The good news is it is possible to buy cheaper student auto insurance if you learn some basic techniques to save money. Let’s go over some simple steps you can implement and start saving right away on auto insurance. There are some hidden perks to getting good grades and putting in all that hard work. One upside many people do not know about is saving money on car insurance for students who earn excellent grades. Any student who is legally licensed and maintains a GPA of a 3.0 or higher can be eligible for a good student discount. Insurers base automobile insurance premiums on risk and decades of stats show those hard working kids who are responsible in class, are also safer motorists. By taking advantage of this simple discount, students can easily 10% off their premium cost. These special deals also last up to 1 year after college graduation, so it is really worth checking into. Get quoted at RodneyDYoung and qualify online for good student saving today. * Most insurers have these discounted insurance rates for students who have and also maintain a B or higher GPA. If your GPA goes lower than this, bring it up as soon as possible and reapply for it. * There is an age gap that stops at 25 years old. * The student must be enrolled full-time. Parents should sit down and talk to their kids and incentivize them to achieve in the classroom so they can not only make more money but save money with discounted savings like this. The automobile that you drive around is a big contributing factor to the insurance rates you pay. In general, the more expensive and “sporty” the car is, the more your premiums will be. This means students who are not rich should be thinking about driving a boring, used car. This can be the difference between paying $250 a month for coverage and $150 or less. Don’t buy a sports car like a Corvette or Porsche whatever you do. Get a utility vehicle like a Jeep or Subaru and you will not only save on coverage but be in a much safer automobile that could save your life. 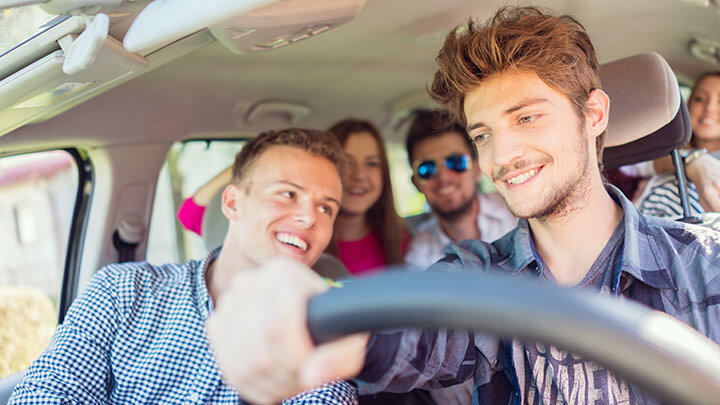 A great tip on saving money for young students is to take a certified driver safety class. These excellent classes are informative and helpful. They give real world examples of nearly every driving scenario and how to react to each one. This practical education helps graduates avoid crashes and reduce insurance claim costs. This is why most auto insurers offer 5% to 10% discounts for completing a certified class. This can add up to hundreds of dollars per year in savings. A safety class can often be finished in 3 or 4 days, so it is not that time-consuming. Those students who go to college more than 100 miles away can get a so-called “resident student” auto insurance discount. Some catches come along with it, but you might qualify. For students who will not be driving during the school semester and use their vehicle on a limited basis, it might work. So let’s say the car is driven to a university 200 miles away and parked. Then on school breaks like Christmas, the vehicle is used to travel home, the discount could be applied. To qualify, students must get proof of enrollment, including the address of the university or college. Also, the auto insurance carrier will require strict mileage accounting. To see if you can get these discounted rates, apply for coverage at Rodney D Young’s new website online or over the phone. Finding the best auto insurance rates is easier now than ever because of the internet. Many automobile insurers offer direct pricing that can save you 40% or more. To get cheap auto insurance for students, start your free on-line quote. At Rodney Young auto insurance, you can compare multiple prices and choose the policy that you need in just a few minutes. Get going now and see how fast you can lower your car insurance bill.